Donald Trump is uncharacteristically silent, following the submission of Special Counsel Robert Mueller’s Trump-Russia report after a 22-month investigation. 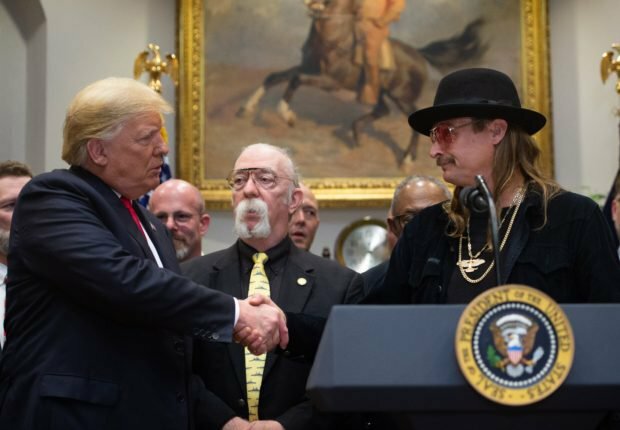 For the first time in months, Trump stayed off Twitter on Saturday, as he played golf at his Mar-a-Lago resort in Florida and had lunch with the singer Kid Rock. One friend that, despite outward good spirits, Trump is anxious about the contents of the report. The silence was in contrast to the initial response by Trump’s allies, who seized upon a remark by a “senior Justice Department official” on Friday that Mueller would not file new indictments. The political and media outlets distorted and exaggerated the remark — possibly to reassure Trump that he and his family do not face criminal charges immediately — to claim “No Collusion” between the Trump campaign and Russian officials in 2016. Mueller’s report is the outcome of a counter-intelligence, rather than a criminal, investigation. However, his team have passed information to Federal and State prosecutors, leading to the conviction of eight Trump associates including National Security Advisor Michael Flynn, campaign manager Paul Manafort, deputy campaign manager Rick Gates, Trump’s long-time lawyer and fixer Michael Cohen, and campaign advisors Roger Stone and George Papadopoulos. Thirteen Russian nationals and three companies have also been indicted. Attorney General William Barr said on Friday that he expected to write Congress this weekend, summarizing Mueller’s “principal conclusions”. An official said that Barr and Deputy Attorney General Rod Rosenstein, who oversaw the investigation, spent Saturday inside the Justice Department debating how to present the findings. The “senior law enforcement official” said only a few people in the Justice Department have seen the report. A copy had not been given to the White House. Mueller’s team had said that the Special Counsel would not indict a sitting President. Barr was briefed earlier this month that no charges would be filed, and that no more subpoenas would be issued — including on Trump for a face-to-face interview. Fearing that Trump might perjure himself, White House lawyers blocked Mueller’s request for an interview for months. Instead, they submitted carefully-vetted written answers from Trump. Federal and State prosecutors, particularly in New York, are continuing criminal investigations of the Trump Organization and Trump Foundation and of Trump’s personal behavior. Long-time Trump lawyer and fixer Michael Cohen, testifying before Congressional committees last month, indicated that Trump may have committeed tax and insurance fraud. TrumpWatch, Day 769: How Much Trouble for Trump After Cohen Testimony?